2017 Update: We still stand by this discussion of crying at work — you may also want to check out our recent discussion of how to get a poker face at work. OK, ladies and gents, let’s discuss: How do you keep from crying at work, whether due to personal reasons or as a reaction to something work-related? What are your best tips to prevent it, explain it if it happens, and clean up your face once you’re done? First, in case it needs to be said: No one’s judging anyone when you’re crying about some horrible recent news — the death of a loved one, for example. But there can be a huge sliding scale of appropriateness and acceptability at different offices, depending on your boss, your team members, and so forth. I can remember two times that I cried at my BigLaw job, although I’m sure there were more. The first time, I was working lateish (8PM maybe), with hours to go on a project that I had to be at the office for and got into a fight on the phone with my father. I hung up in anger and literally crawled under my desk to sob, hoping it (and my closed door) would muffle the sounds. The second time, as I’ve mentioned before, was the time I missed my best friend’s wedding because of work. We had to meet a deadline at 5PM on a Friday, and my BFF’s last-minute, mostly-family wedding was slated for noon the next day — in London. My bosses and I had discussed the situation, and everyone (including me) agreed I had to stay. This didn’t do anything to alleviate my self-pity (and self-fury). On Friday, in a meeting with the partner and senior associate, the partner brought it up again in what struck me as a daffy way (gee, such a pity you couldn’t find a commercial flight!) and I lost it. Tears flowed onto my suit — hell, probably onto the partner’s fancy rug — although I maintained my composure as far as breathing was concerned. The meeting ended with neither the partner nor senior associate directly mentioning my distress. Later the senior associate came to my office, nearly crying herself, and shut the door and told me to feel free to let my anger out. I sputtered something about being SO. FRUSTRATED. WITH. MY. LIFE. but that I’d get over it. So: what the hell do you do to stop this annoying show of emotion? One friend told me that he sang the MacGyver song to himself whenever he felt overwhelmed by his feelings. The best practice regarding crying at work is probably to hold it together long enough to get out of the building and go for a walk or even to a public bathroom like a Starbucks and have it out. Of course, it helps to get adequate rest and relaxation — if you’re sleep deprived and stressed it primes you for crazy emotions. We’ve also talked before about how to mitigate hormonal mood swings, such as with calcium. Keep your blood sugar stable and eat foods for energy at work, stay hydrated, and try to fit exercise into your day, like with lunch workouts. Also, I’m curious to hear what readers think about this: is age a component to controlling your emotions? Or does one just get jaded, or perhaps have lowered expectations, as you get older? I find that I rarely cry these days, or if I do it comes on like a flash and then is over. I suppose in general it’s good advice to everyone who is very emotional to take a close look at your expectations for the situation, and make sure they’re set at appropriate levels. As far as cleanup after crying at work: Visine plus one of those cold gel face masks is the best advice I’ve got. Running cold water over your wrists (or pressing something cool against them, like a soda can) can also help get the redness out of your skin. Feel free to use Visine liberally, either by squirting it onto a tissue or directly onto other red, puffy parts of your skin: as a vasoconstrictor, it narrows blood vessels and can make skin look less red. After the day is done, check out some of our tips for how to turn a bad work day around. 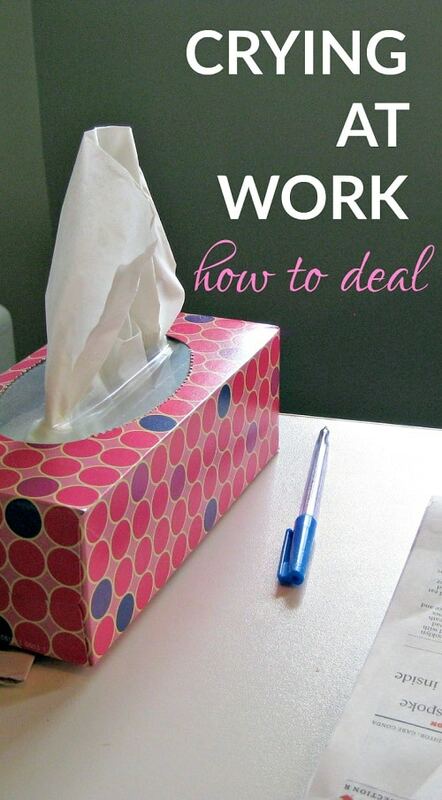 Ladies, what are your best tips for avoiding crying at work? (God, I’m not the only one with these stories, am I?) What makes a “junior employee crying at her desk” story better or worse? If she carries on afterward as if nothing happened? If she explains it later? Also, what are your best tips for cleaning yourself up after crying at work? I cried at work last week. It had been a stressful two week run-up to having a critical client on site. In a break during our day-long meeting I checked my phone and found a text telling me that my father had been diagnosed with metastatic cancer. The combination of the stress and the diagnosis sent me over the edge. I already had tears in my eyes but I quickly walked away from my desk to an empty hallway and then finally into the empty room reserved for nursing mothers. I let myself cry for a few minutes and then stepped into the bathroom to put some cold water on my face and collect myself then went back to the meeting. My management told me I could go home but I wanted to finish the meeting and had already committed to making airport runs for the client. Got through it without anymore crying then let myself sob on the hour-long drive home. Dear G-d, I would never have missed my best friend’s wedding for work. If you were really able to leave at 5, you could totally have made it in time. It’s a 7 hour non-stop flight and the red-eyes get in early morning London time. Maybe the partner was trying to point that out and not trying to rub it in that you weren’t going. I’ve never cried in the office, which is actually surprising to me since I tend to be a pretty big crier. Although when I think about it more I usually tear up at sad – or even happy! – movies, books, even songs on the radio, but rarely cry about real life events. I cried once in my first couple weeks in Big Law when a senior associate said something really cruel to me about me not having having the right personality for the job, but I didn’t cry until I got home and relayed the story to my now-husband. That senior associate actually cried in her office all the time (albeit with the door closed), which I found a little ironic given her comments that *I* wasn’t tough enough for the job. I guess I should say “I’ve never cried about work in the office.” I closed my office door and cried when I found out about the Boston Marathon bombings. I lived there for many years and although my few friends still in the area had posted on social media that they were ok, it hit really close to home because I used to go to the marathon every year and it was horrible seeing a city I love so much attacked like that. +1 I do not understand how you are mad at Partner. Partner clearly assumed that you had tried and failed to get a seat on a commercial flight going overnight to London so that you could still make the wedding. I find it remarkable that there were no seats on any flights between NYC and LHR that would have been available. If memory serves the only flight that would have gotten me there in time for her wedding would have meant I would have had to leave work before 5PM. I don’t remember if it was the last flight out that night and it was at 6:30 and they wouldn’t let me leave at 4:30 — or if my friend’s wedding was at 10AM or some time at which I couldn’t have made it from Heathrow to the wedding locale reliably. I assure you though that at that time there was no way to get to my friend’s wedding and make a 5PM deadline. This was years ago now though so I don’t 100% remember the details. Was I justified? Who knows (or cares). That’s not what the post is about — whether I was justly pissed at my colleagues or the situation — just that I had feelings that overtook me at work. – I’ve been lining my inner eye rim for a while, but touch it up post tears and you can’t see much of the redness. Physicians Formula black liner is good for this. Easy to carry in my purse. – My tinted moisturizer (Sonia Kashuk Target) does a great job hiding my red nose and I don’t even have to reapply. – Big sunglasses all the time. I’ll even walk around my neighborhood and cry sometimes with the sunglasses on and this feels kind of private. – With these tricks, I don’t try to control my crying or worry about the aftermath – I just cry when I need to and come back feeling better 5 minutes later. Incidentally, this makes me feel emotionally much better too. – Find the person in your firm that you can unload to, at least in part. It will give you a feeling of calm to know you have someone you can touch base with. Wow, so sorry you’re going through that. Hugs. Thanks, everyone. The silver lining to this is that it really has changed how I look at life and self-care – I just DGAF if someone sees that life is tough, I’m struggling with it, and work is but a small piece of it. I’m not going to live in fear of taking care of myself this way – no judging myself for these emotions. I’m so sorry you’re going through this, and also super impressed with this very strong and healthy approach to your emotions. Ha, it’s been hard-fought :) My therapists and support network have been wonderful. I’m really inspired. I’ll be keeping you in my thoughts. Likewise, let them know if you want them at calling hours or not. Our default is to go but if you are private and don’t want them there, politely let your preferences be known. They will be respected. I’m so sorry you are going through a difficult time. Wow… you missed this totally. You made it all about you.. The poor guy’s wife is dying, on hospice at home….. and it is his responsibility to tell you what he needs, or YOU would be upset? Are you kidding me?!?! One of the worst things you can do to someone in this situation is say nothing. But most do exactly this. And make you feel even more isolated. One of the next worst things you can do is to say, how can I help. That also puts the stress on the person to ask you to do something that you probably don’t want to do, as most people don’t really think about what this means. Because if you really wanted to help, it’s not that hard to think of something small that would be helpful. You offer to take something off their plate. You tell them you are thinking of them. You help cover for them if a crisis happens off hours. You send a week’s worth of dinner to their home or you cook them a lasagna. You say I’m so sorry you are going through this. This is a perfect example of how people who haven’t been through it don’t get it. Disagree. I have gone through a few tough times and sometimes, work is a refuge. It feels good to be seen and treated as “normal” for a little while before going home and being the caretaker/grieving family member again. I am not the only one. We had a client who’s spouse unexpectedly died. We sent flowers to her office when she returned to work. When I next visited, the flowers were on her partner’s desk. I asked the partner who said that she just didn’t want to be reminded of the death at work and was trying to carve out some normalcy. Friends and family should be supportive and bring dinner, etc. Work people, though, I think it depends on how the affected person wants to be treated. It is good to offer but if you keep getting turned down, take a hint, the person doesn’t want special treatment and there is nothing wrong with that. We reached out a few times and the way he responded it appeared he really wanted us not to bring it up so we didn’t. And we did what you suggest. We helped him in less obvious ways. Like I said, I’d find out his deadlines and ask if I could work on them. We didn’t take everything away though because he wanted the work, or so it appeared. I certainly said many times, give me any work you want to give me and I will happily do it for you. I just couldn’t make him give it to me. I’ve cried at my desk (with my door closed – nobody has seen me) probably 5 times in the last 2 weeks. It’s all work-stress related. It happens when I think too much about how to possibly get everything done, or when it’s the evening and I’m swamped and more stuff comes in. Maybe I should be embarrassed that I don’t have a better grip on my emotions, but I’m not. I mean, nobody sees that I’m crying. I really think that, at least for me, crying is a way to alleviate some of the physical stress that I’m holding in my body. It’s like a pot that boils. I cry and feel bad for myself for a minute or two, and then I’m a whole heck of a lot calmer and can go about my business. I’m kind of surprised that I cry, actually. I’m in my mid-thirties and have myself together. I think my friends would be surprised to know that I have ever cried at work. But of well — there are bigger things to worry about right now than about whether I shouldn’t cry! And the Chairman’s office was next door. And his secretary was waiting outside already, waiting to usher me in. I was totally caught by surprise. Before I knew it, I was sitting in front of the Chairman. Not prepared for this meeting in any sense of the word… but especially emotionally….. Because the terrible critical illness that my parent had, was also one that had struck the Chairman’s daughter. I knew this. The Chairman was open about it, and knew I would know this. So after I bumbled through explaining my “life goals”, and “where do you see yourself in 10 years”, and “why aren’t you saying you want to be CHAIRMAN”, and “what would your advisors say about you” etc…. I had to answer why I was not currently working. And as I said what happened to my parent, I suddenly froze with tears running down my face. Because part of me realized he was one of the only people I had spoken to who might truly understand what I was going through. Don’t get me wrong… I didn’t want to be crying, and tried like crazy to hold it in. But there it was. OMG – it might have been for the best in the end because if he was so horrible in that situation, I can’t imagine working for him would have been pleasant. You dodged a bullet there. Who would want to work for such a bunch of assholes!!! That is horrible! I am so sorry! Do you really need a fancy ring to marry the man you love, and who loves you? Just get a small ring and do a small courthouse wedding and backyard picnic. Also, this is a crazy overreaction to not getting a big ring- you cried and cried over that? What’s up with all the comments telling people whether their feelings are valid or not? We talked about a small courthouse and picnic, he says I deserve more. I am not going to argue with that. And as far as overreaction, yeah perhaps. But I quite frankly don’t need your validation for my feelings. Of course you aren’t engaged – if you had that reaction, no way he’s going to propose with a small, or non-existent, ring. If you want to be married to him – tell him that! The ring should not be important! I got engaged sans ring and a relative stepped in and offered my now-husband an heirloom ring, but I would have been just as happy without. Your reaction told him that a ring was more important than him, and his ” telling me how he wanted to buy it and I deserve everything in the world” was your chance to tell him that his financial status doesn’t matter. If it does, you should break up. I teared up/let a few tears fall in front of my supervisor when she asked “are you okay” to my obviously upset/depressed looking face. I had just found out two days before that a dear relative who is like a second mother to me was diagnosed with stage IIIC ovarian cancer. It was a mistake to cry in front of my boss, though, since she asked “are you okay” every time I saw her for the next few months and said I seemed “emotional” during a slight argument several months later. I’m crying at work right now. WTF, 2016? Hey at least you’re pregnant. With all the talk about loss & IF, count your blessings. Um, ouch? You don’t know anything about my circumstances and how I got to this place. I’m sorry if you’re going through something, really truly. I do feel blessed to be where I am, but please don’t assume that it’s been easy. Here’s an anonymous internet hug from another pregnant lady who has been crying for hours over Prince. I’m generally a “go home and watch crummy tv and cry myself to sleep” sort, which I suppose is “lucky” in that I’ve rarely been close to crying at work. That said, anyone have a solution/coping mechanism for dealing with work people who cry when they get angry? I try to be empathetic and not make a big deal out of it, but it is probably my least favorite behavior. My go-to is either getting out of the office for lunch and/or online shopping, but it’s very upsetting to me. Ignorere it. I hate when it happens to me, I can’t control it, and it feels awful. They are not tears from sadness, grief or being overwhelmed. They are just stupid water droplets. Will do! My initial reaction is, “I should fix it I should fix it fix it fix it FIX IT FIX IT HOW DID YOU F UP SEVENTH,” so it’s good to know to ignore. I have only ever cried at work once, and unfortunately it was because of my boss. We hadn’t been getting along for some time, and I was doing everything within my power to make the situation better. When that didn’t work, I spoke to my boss’s boss, who then of course went to speak with my boss. Well, when my boss debriefed me, she made it sound like her boss agreed with her and essentially I was just an exaggerating Milennial (definitely not true, but not important to the story here). I wouldn’t give her the satisfaction of crying in her office, so I excused myself as quickly as possible and hightailed it to the building rooftop. It wouldn’t have given me any privacy if someone had joined me up there, but thankfully no one did, and either way it wasn’t any worse than my cubicle. I pretty much lost it, called my boyfriend and spoke incoherently for about 20 minutes before pulling myself together and going to see HR. The situation was ultimately resolved by reporting to my boss’s boss instead. I’ve cried at work a few times, as have most of the women I know at my firm. I think it’s very similar to the folks who throw temper tantrums. An overly emotional display about something that (to an outsider) might not deserve such high emotion. For me, it’s always been related to anger or to a feeling of extreme stress. I will typically breathe deeply and try not to speak. For me speaking makes it worse for some reason. I hold it together that way until I can get out of sight. Usually in my car in the parking garage. I have dialed my own cell phone so that it looks like I’m on the phone in my office and then shut the door. That was only once when I truly couldn’t leave the building. I’m really not convinced that most environments really should be so stressful and emotionally charged that people cry or get so angry on the regular, but I suppose that’s a topic for another day. I have the opposite concern of Kat and the posters here. I wonder if there is something wrong with me because I don’t cry at work (or literally ever). I always wonder if I have some emotional problem resulting in dulled emotions, perhaps from growing up in a war-ridden country. I don’t even remember the last time i cried. It was probably when I was a small child. I grew up in a very abusive household. I was yelled at and made fun of my father for crying, and he made me feel so awful. I learned I had to hide, never show sadness or fear or anger because then I would get it….. So yes. Learning how to numb your self to the world is a survival mechanism. I’m the same way – I didn’t really grow up in a place/at a time where it was OK to cry or get upset very often. As a result, I rarely cry in front of others and rarely get upset enough to cry. Just out of curiosity, any advice for dealing with a “crier” at work? A coworker wears her emotions on her sleeve, which is fine, but literally runs crying out of the office or to the bathroom a couple of times a month. It’s a small office (10 people) and she’s a loud person, so everyone is aware that X is upset again. I try to be sympathetic, but sometimes it’s just too much drama. Her manager is the one who should be dealing with it, not the other employees. Loud sobbing several times a month is disruptive and completely inappropriate for a workplace. Your coworker needs to get some professional help with controlling her emotions or she needs to find a different line of work. But IF you want to help her and you have time, next time it happens I would say something like “I’m sorry you’re so upset. Is there anything I can do to help? Happy to take a walk around the block with you and get some fresh air.” Anything you do to get her out of earshot of the rest of the office will be a blessing to everyone and being in motion helps stop crying. You could also offer to get her a glass of cold water to chug (classic trick that stops crying for some reason). You don’t want to end up being her personal counselor, but a little attention could go a long way. I cried after I got what IMO was an insultingly small bonus bump. Kept my composure in my review, went to my office, closed the door, and quietly cried lots of angry tears. I may or may not have thrown some small objects. It’s a little embarrassing to think of now, but I had worked until about 3:30AM the night before, so I was sleep deprived and feeling incredibly undervalued. I still think I was screwed out of an appropriate bonus but I don’t take it so personally now that a little time has passed. I just kept my door closed pretty much all day, tried to take deep breaths, and reapplied my concealer before showing my face. I tend to cry more out of anger or frustration than sadness or feeling overwhelmed. I know that in general I get red when I’m emotional, so that’s a bigger issue than crying. I try to tell myself that if I’m angry enough about something I can feel my neck getting red, hopefully it makes me look more intimidating and passionate. There just isn’t much I can do about it besides let it pass. This is definitely me. I cry when I get really angry and frustrated. Like yesterday when a partner snapped at me for his (repeated) mistake. He literally made some snide/frustrated comment to me because he didn’t realize that he had dropped the ball. I was left in that awkward position of I couldn’t exactly say “this happened because you didn’t do something you said you would do.” So instead, I tensed up, went back to my office, and cried the anger out. I do this as well – when I am really, really frustrated, I’ll start crying because I see no way out. I had the same raise/bonus issue last year, and I was dinged due to trying to get an accommodation for my disability. Boss, and boss’s boss, are now being investigated for said discrimination but it was horrifying at the time. We always say lawyers are the worst offenders…. This is me also. I honestly think time and experience has helped. I used to cry more than I’d like to admit and it was usually due to me feeling worthless or that I’m not good enough at my job or something like that. I’ve finally learned to detach from my work and to realize that others just have a different perspective and it is not necessarily something I did wrong; just different. Sure, I still get frustrated sometimes and I believe the best strategy is to walk away and get out for a few minutes. I have cried in the car outside my office a few times, but lately with a horrendous situation in work I’ve cried out of pure frustration several times. I just reached the stage where nothing could stop the tears. Luckily a new hair style allows me to tilt my head forward and my hair falls forward over my face. I am a mid level (two promotions and four years in) management consultant in my mid twenties and have cried at work more times than I can possibly count. Honestly, I moved fairly quickly through my organization and have been in over my head at work so many times, and/or have had completely insane clients. This has generally resulted in me with a locked door in an obscure bathroom somewhere deep in the bowels of the building I’m in or in some deep dark corner of the parking garage sobbing out of general stress/exhaustion (lol), but has a few times been when I have had sit downs with my boss or higher up and I just can’t quite keep it in any longer. Not many people at work have seen me cry, but as I’ve come up and am leading teams I’m pretty honest about how my experience coming up was, how tough it was, and how overwhelming it can all feel when you are young and haven’t figured out that work isn’t life. I think the stigma around crying at work is a little silly, especially in extremely high pressure long hours professions with young people who aren’t used to this, and don’t know that “this too shall pass”, that there will always be another chance. I try to be honest about how I got where I am, including the not very glamorous parts. I just moved from a horrible work situation that compounded a nasty depressive episode. I cried in the middle of my review. I will never get over the embarrassment of it. The partner was nice enough about it but tried to assure me that “it’s worse for her to have this discussion”. The kicker is that I still got a decent (though not spectacular) review. I’m still mortified by this. This might out me but here goes….My first job during/after law school (starting spring semester of 3L) was working as a clerk at an insurance defense firm (I know…) They told me I would be getting an offer to work as an attorney as soon as I passed the bar, and I even moved to the area based on this. Then when I did pass the bar, the next day I was told that I wouldn’t be getting a position. I got teary-eyed (mostly with anger, as some have mentioned), and a well-meaning female associate pulled me aside and told me that I could never show my emotions like that at work if I wanted to be taken seriously. I quite literally told her that I didn’t want to be somewhere that I couldn’t show my emotions and to this day, count my blessings that I didn’t end up doing insurance defense!!! I’m a big law senior associate, so suffice it to say that I have cried at work (though fortunately I have been able to hold back the big tears until safe in my office). I read somewhere that pinching that little bit of skin on your palm between you thumb and pointer finger can help control crying. I don’t think doing this causes any sort of physical reaction, but it at least gives me something else to focus on other than “don’t cry don’t cry don’t cry” running through my head. The tears hit me at work when people are mean to me – as a 34-year old woman, I realize how silly that sounds! But it’s really meanness or inconsideration that hit me hard. I’ve learned over the years that I can’t – and don’t want to – become an emotionless robot, so I let the crying happen. I just handle it differently and as privately as possible. I have a secret spot in my office that is never used (better than the communal bathrooms) and I’ve stashed Visine, concealer, mascara and powder in there. I duck in there when I feel myself getting close to tears and let it go. It’s MUCH more productive than trying to hold back, which never works and is just embarrassing. Ha! Great post – I have cried numerous times – mostly due to me and others being incredibly frustrated with how we were being overworked and undervalued! I worked in retail for 5 years and its the worst! 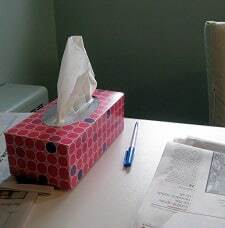 I don’t recommend crying at work if you can help it – get some fresh air, get away from the environment, eat drink and try to relax as it’s only a moment in time. Having said that I haven’t received any negatives from crying as such, just the sheer embarrassment of it! In fact it’s often worked in my favour – bosses and co-workers ended up communicating better because of it. And Bosses I think often have a reality check and the situation gets resolved. Found this after crying at work today – my mentor had to give me a bad performance evaluation from my last trial (merited because I did not do a good job at all, for a variety of reasons). Anyway, I hate hate hate that my reaction to a certain kind of criticism is to cry, but it is. It’s just a stupid physical reaction – it does mean I’m upset, but it doesn’t mean I disagree with the comments or don’t want to hear them. I can usually hold back the tears up to a certain point but once one breaks through I’m doomed. Mostly I’m commenting to say that I’m really grateful for my mentor, who is super supportive and has my best interests at heart. She absolutely didn’t sugar coat anything but she also made clear she didn’t think less of me for crying about the situation. So I hope if I’m ever in her situation I can be equally supportive to someone else.